Assembling Magazines 1969-2000 by Geza Perneczky (Budapest, Arnyekkotok Foundation, 20 Euros plus postage and handling 20 Euros) is a gargantuan tome, planned to be the second volume of the Soft Geometry Archives catalog series and was going to be limited to the philological listing of assembling publications in the author’s collection. It was meant to be supplemented by a selected corpus of illustrations and an index of authors involved in various publications. Perneczky later decided to add a longer historical overview because 70 to 80 per cent of known assembling periodicals are represented in the archives by at least one, but often a dozen issues. This collection might, therefore, give a full panorama of the entire history of the genre (1970 to 2000) and it seemed obvious that this panorama should also be accounted for in the form of an essay. When Geza looked at his collection, he realized that more than 90 per cent of all published assemblings came from the Network and the Mail Art System. He also added some classic assembling volumes such as Henri Chopin’s OU Revue or the fifth issue of Bob Cobbing’s And–which shows the evolution of the genre. The author also regrets not getting his hands on several significant Mail Art assemblings that would be indispensable for sketching out this history. For clarification, Geza begins with the terminology such as “Underground, Network, Mail Art, Artist’s Books, Alternative Art” and so much more. If you want to know what assemblings are, they are limited edition publications, for which the editor had requested a certain number of copies of statements and contributions by the authors and then the author would compile them into periodical-like publications whose number of copies cannot exceed the amount of copies submitted. Thus, Assemblings are always periodical-like anthologies of original works, which does not mean, however, that their source material has the same function as original, that is, “unique” pieces of art entered into the art trade. First appearing as paperbound book-like volumes or booklets, now spiral-binding as well as metal or plastic staple splints have gained prominence. Editors usually decide beforehand as to the number of copies of each assembling publication as well as the size of collected and published contributions. Many assemblings also were collected in folders, cardboard boxes, envelopes and plastic bags. The second and longest part of the book is the history of these Assemblings–a very long history which is essential for any collection of contemporary art and art publications. This is truly a scholarly approach to an alternative kind of publication, one appreciated perhaps more in Europe than in North America, but now truly a chapter in the history of artist publications. It is a major contribution to the literature and to the understanding of what was going on over three decades to create a body of literature unknown to most libraries. Next comes references or bibliography of Assemblings, and then a chronological description of each Assembling with small photographs to identity them from the 1960s to the year 2000. Then a selection of texts from the Assemblings of Clemente Padin, Richard Kostelanetz, Edgardo-Antonio Vigo, Jeanie Black, Balint Szombathy, Sheila Holtz, Vittore Baroni, Louise Neaderland, P.S. Roberts, Robert Zito, Bill Gaglione and Jean-Claude Gagnon, among others. or e-mail to: arnyekkotok@freemail.hu. This is a limited edition of 500. What You Speak is Seeing You: a book on prosperity consciousness with words by Christiane Schull, pictures by Nicole Katano (Los Angeles, Outrageous Good Fortune, 2006, $60.00 hardbound) is a symbiotic collaboration between a writer, Christiane Schull, who founded The Prosperity Circle, “to help people identify patterns of thought, word and action that block them from being who they are and having what they love.” Teaming up with Nicole Katano, photographer, six years later, has allowed both the words of Schull to be illuminated, advanced, and driven by the sensuous images of the photographer. Prosperity is a feeling of being in the flow of life, accepting ourselves, feeling capable of tackling whatever might come our way. So developing a prosperity consciousness is also developing oneself. Each image which Katano lends to the words is a diptych, many images of which are in Nature, but also in familiar environments. To illustrate feeling of “love, appreciation and gratitude” are difficult enough to conceive, but Katano seems to find something within and outside herself to illustrate the words of Schull perfectly. The book is keenly designed on the horizontal, almost like a landscape, first of words and then juxtaposed with a dual image that enhances the meaning of the words. One’s thoughts, words, and actions are expanded by understanding that we are victims of our own thoughts, but can obliterate the ugly and renew, restore and transform our thoughts to positive mode. 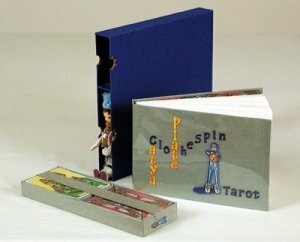 Clothespin Tarot by Catya Plate is housed in a slipcase with three compartments, holding the book, the card tray, and an original “Clothespin Freak” sitting figure which has movable parts and consists of custom-made clear, plastic clothespins, doll’s body parts and sewn pieces. The tray of Tarot cards contains two compartments housing 78 cards with all created on an Epson Inkjet Printer, with a Velcro closing to keep the cards in place while sliding out the tray. Embroidered letters and the “Clothespin Freak” appliqué is attached to book cover and spine. There are 79 color reproductions of the artist’s original drawings printed, one-sided, on 87 pages. Now if you are still wondering what this “obsession” with clothespins involves, it really does not reflect the standard association of woman’s task of doing the laundry and hanging the clothes out to dry. Instead, Plate sees the clothespin relating to the human body. Emphasizing the small and unassuming things in our normal lives, rather than the technological advances which have come to dominate our lives, the Tarot cards are inventive, ingenious, and each card centers on a clothespin doll with manifestations of the original Tarot card implications. The Darners, Thimbles, Hatpins, as well as cards with Hanged, Death, Priestess are all created with the metaphor of clothespin. This is more than a Tarot Card set, it is a thinking artist’s project to philosophize, criticize and analyze the use of one symbol to demonstrate all the potentials of the symbols of Tarot. Flitting between comedy, children’s book illustrations, and Blake-like mysticism, the cards show a labor-intensive project which is manu-factured (made by hand) by a seasoned artist, whose sense of humor and sarcasm is enlightened by what she is doing with an age-old fortune-telling device and just with living and experiencing what life has to offer. The evolution from Clothespin Mandala drawings each bordered by a fringe of actual wooden clothespins to these Tarot drawings which introduce anthropomorphic figures arranged in various traditional Tarot card poses seems quite logical. Included are subversive principal characters rebelling against the establishment of the “suits”. Instead of swords, wands, coins and cups, the 56 Minor Clothespin Freaks make use of hatpins, darners, buttons and thimbles, alternative implements characterized by their feminist references. To use the deck, shuffle it well, select a card, turn it over and consult the text on the page for that card, taking into consideration the card’s orientation. And no particular spread is required. What is intentionally humorous, sarcastic, and serio-comic is the text accompanying each of the 78 drawings. Paragraph one is a description of the corresponding picture. The next two parts are the interpretation for normal and inverted orientation fo the image, delivered to the reader in by the artist’s invention, the two-headed Clothespin Freaks. “After all, two heads are better than one.” The advice is colored by wordplay, double entendres and idiomatic expressions, influenced by cultural, psychological and other references to produce open-ended, amusing and thought-provoking allegories. As a result, this book is serious, playful, comic, tongue-in-cheek, and a game at that. It is to be played, with credentials of credibility, outrageousness, and delight. It is a game, a hint at the game of life, a game of chance, a game of hope. Each reader will take it as it comes, or make it happen in a different way by reading and indulging in this bookwork and in this game. The work is a totality, from concept to execution, made by one uncanny artist who has more talents than one can imagine. 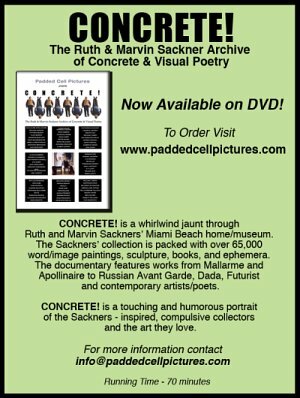 For all contemporary artist book collections, for Tarot card collectors, for feminist collections, and for all collectors who delight in something different. $650.00, ed. of 50. Distributed by Vamp & Tramp and by Booklyn. Not So Too Much of Much of Everything by Naoko Takahashi (London, Book Works, 2007, £6.50 paper, ed. 1000) takes the reader on a breathless journey through the air-conditioned rooms and arid streets of Dubai. The narrator’s sexual freedom is confronted by rumor, suspicion and threat. Every move the narrator makes, whether in solidarity with Arab women, street cleaners and bar staff, or confronting male hostility, is misread; her identity repeatedly forced upon her, manipulated and rendered paranoid. This chapbook is based on personal experience of a three-month residency in Sharjah, United Arab Emirates. The book is written as a series of jotted notes made by a daily observation, exploring ideas of dislocation, mistranslation and gender politics. Moving from confusion and isolation to corporeal anger, the artist’s residency and the everyday frustrations of making work in a new context are cast as a modern allegory of alienation. It’s a quick read–truncated sentences, quite phrases, fast thoughts. (No. 7 in Book Works’ Chap Book Series). Letters 2004-2006: Confirmation That You Still Exist; I Respect Your Authority; When Will It End; One London by Martin John Callanan (London, Book Works, 2007, £7.50 paper) is an exploration of apparatuses of power. Callanan is a mass letter writer. Each letter poses a deceptively simple question or even inane rhetorical statement and the collected responses reveal the absurdity of bureaucracy and the egos of those that claim power. Collected here are responses to a series of letters mailed between 2005-06, ranging from the bemused response of the Secretary to the Archbishop of Canterbury to the question “When will it end?” to appreciative letters from the offices of President Mubarak of Egypt in response to the declaration “I respect your authority.” I am reminded of Jeffrey Vallance’s letters to heads of state asking them for a tie (a men’s tie, of course) and the various responses. Epistolary art in the form of mail is an age-old technique–and this one involves politics as well. (Book Works’ Chap Book Series,no 8) The design of the “portfolio” containing the letters, as well as a list of all those contacted for each subject is beautifully conceived. Cindy Sherman: A Play of Selves with a preface by Cindy Sherman (Ostfildern, Germany, Hatje Cantz Verlag, 2007, $35.00 hardbound) is an artist book. But in 1976 it was exhibited for the first and only time in Buffalo, new York , during Sherman’s last year at university. Included here ia new introduction written by Sherman, the scenes of the four-act visual play, 245 cut-out figures, and the original handwritten script and production notes. Having first begun experimenting with make-up and costumes, getting dressed up for parties and surprising her friends, Sherman then moved on to photograph herself in the various personas she had created, producing highly inventive but somewhat more primitive versions of the seminal work for which she would later become known, the Untitled Film Stills series. So at this time she created A Play of Selves–a visual narrative of a young woman overwhelmed by various alter-egos that compete inside of her, and her final conquering of self-doubt. Acted out with 16 separate characters, these 72 photographic assemblages mark Sherman’s earliest explorations of herself-as-subject in a series of staged photographs. Published here for the first time, these photographs include hundreds of shots of the artist costumed as various characters in dozens of poses. The cutting was tedious, but at that time, she said she had a lot more time on her hands at that time–and she didn’t have Photoshop. .Organized in a four-act “play” with an elaborate, handwritten script, the individual images were cut by the artist from original black-and-white prints. Characters range from A BrokenWoman to The Ideal Woman, The Male Seducer, The Narrator, The Female Seducer and much more. Distributed by D.A.P. Mangos and Bananas is a gloriously illustrated children’s book from Tara Publishing. More artist book than children’s book, the text tells of Kanchil and Monyet planting a banana and a mango tree and watching them grow, finally creating fruit which needed to be harvested. Since Kanchil could not climb trees since he was a mouse deer, he conned Monyet to climb the tree and pick bananas, but Monyet ate them all up. In order to save the mangoes for himself, Kanchil plotted and executed so that in the end, the mangoes were his in entirety. You must read this book to find out how it all ended–and what a beautiful book this is. Story by Nathan Kumar Scott, illustrations by T. Balaji, $16.95 hardback available from www.tarabooks.com or your friendly bookshop. There weren’t many girls around, so we dated ideologies. This left us always on the brink of war. We often discussed that a likely result of battle would have been more girls to go around amongst the survivors, but we quibbled rather than acted, & slept alone in our cold beds dreaming of glory by Ami Tallman (Los Angeles, 2nd Cannons, 2007, ed. Of 500, $28.00 softbound) is a series of drawings of interiors, occasionally interrupted by men in uniform, that tells the story of a young aristocratic heir to an English country estate who abandons his manor when coerced by a fetching young member of the Red Cross into taking up trench warfare. The book follows his recollections from the field regarding his old family pile. Tallman is a Los Angeles-based painter, and her paintings full color and full-paged and more add to the lusciousness of the interiors, environments, architecture of this English country estate A wonderful transition from full memories to partial ones where words had to fill in the blanks, and yet there are always blanks. This story almost without words, but always hungry for words. A commemorative piece for someone who went before. Beautifully designed and printed. A must!and probably the longest title you could ever find. Available from Printed Matter. The Book of Origins: A Survey of American Fine Binding by Karen Hanmer	documents the 2007 traveling exhibition featuring 20 contemporary bindings by ten American binders, including masters as well as gifted emerging artists. Each binder is represented by two works, their binding in response to the set of The Book of Origins text, and an additional example of their work. This is an extraordinary catalog for its exquisite photographs (by Peter Verheyen, and the exquisite design by Julie Leonard. It is $19 with postage, it can be ordered via Paypal, or you can send a check to Karen Hanmer, 709 Rosedale Rd., Glenview, IL 60025. Visual Writing re-connected by Luc Fierens documents a selection of works from a 23-year activity of this Belgian collagist, visual poet and mail artist: collages, visual poems and collaborations with fellow mail artists/visual poets. Essays are by K.P. Dencker and Jan De Vree. Fierens lives in Weerde, Belgium, centrally networked (since 1984) into a vast web of European mail artists which extends to the US, contemporary Fluxus artsits, neo-dadaists, performance and sound poets, and with visual poets working in the area of collage writing. His works can be found in major archives (Ruth and Marvin Sackner Archive), libraries (MOMA Library, University of Buffalo, etc. and several private collections. His visual poetry was selected for the book “A Point of View: Visual Poetry: The 90s, An Anthology” edited by D. Bulatov, Kaliningrad 1998 (Russia). A new collection of small artists’ books dedicated to experimental, concrete and visual poetry, or any work combining text and visual arts in the spirit of Dadaism or Fluxus is now available from Redfoxpress in County Mayo, Ireland. Each book is 40 pages, A6 format (10.5 x 15cm or 4x6”) with a cardboard cover, screenprinted and/or collaged, laser printing on ivory paper and the price for each is 15 euro or $20.00. Fernando Aguiar: Calligraphies shows the artist using his hands to interact with letters–single letters, lettraset sheets, letters on stones, letters on his fingernails–as if it were all choreographed. Luc Fierens: Gunpowpoems is a series of collages using pages of a book on minerals with photos of stretch exercises by a woman, photos of famous men or events, diagrams of human organs, all ending with the atomic bomb blast! It is a blast from the past, with dynamic overtones. Klaus Groh:Bon-ap-Arte is another series of collages created from images of Napoleon intermingled with art, artists, film stills, and slivers of sentences with allusions to much of art history and visual poetry. Richard Kostelanetz: Fulcrapoems with full pages of words, words and more words from A pages to the Y page–a litany of words which means with the eye what the mind cannot fathom. A Flexible History of Fluxus Facts & Fictions by Emmett Williams (London, Hansjörg Mayer dist. by Thames & Hudson, $45.00 hardcover, 140 color illustrations) is characteristically irreverent, where Williams turns cartoonist as he explores th roots and fruits of “the most radical art movement of the past half century.” He follows in the footsteps of Lyonel Feininger, Rube Goldberg, and Ad Reinhardt; his colorful, pseudo-historical drawings, painstakingly remastered by Ann NoÃ«l for this edition, are often peopled with less than flattering made-up images of his real-life friends and colleagues: George Maciunas, John Cage, Joseph Beuys, Claes Oldenburg, Yoko Ono and John Lennon, Nam June Paik and Charlotte Moorman, Christo and Jeanne-Claude, and so many more,.including Emmett Williams and Ann NoÃ«l themselves. No doubt the book is in character by being irreverent and pseudo-historical, but in the author’s introduction, he cites the fact that Maciunas, the “father” of Fluxus, once defined ”“Fluxus art-amusement” as “a fusion of Spike Jones, Vaudeville, gag, children’s games and Duchamp” and so Emmett’s collages seem to fit right in. He first created the fables –on the right-hand pages of the book, and only gradually, did he come to realize that there was at least “an iota, a jot or a little truth–and sometimes a big blob of reality–in each and every one of them.” On the left-hand pages, opposite each of the cartoons, are enlightening documents from the author’s personal archive relating some of the unlikely things that really happened in Performance Art “show biz” over the years. Yes, even Marcel Duchamp is the star of this “show”. Being the last book Emmett Williams created before he passed away this year, we feel this is the most humorous, the most comprehensive, and the best example of his Art/Life existence on this planet. Emmett, we really miss you. White Fungus, Issue No. 7, edited by Ron Hanson, is an experimental arts magazine based in Wellington, New Zealand. Its range includes music, visual arts and literature. The current issue, number 7, has articles on New Zealand photographer Yvonne Todd and Japan noise artist Merzbow. It also features an interview with LA writer Chris Kraus talking about her new novel ’Torpor’. The journal editor is not afraid of getting political in his editorials, getting historical in reminiscing about Victorian-era tourism in New Zealand. In addition, art criticism in done with color photographs, featuring the New Zealand artist Yvonne Todd, who won the Walters Prize in 2002, the most prestigious visual arts award in New Zealand. She won with a series called Asthma and Eczema, dark and surreal photographs which include such ominous images as a staged and painfully perfect dewy rose, a carefully manicured hand with long extended fingernails and a number of shadowy back-lit portraits with faces obscured in darkness. The article is interlaced with long paragraphs from an interview with the artist, and it works. Another feature in this issue is the Japanese noise artists Merzbow, as well as a conversation with Chris Kraus, the Los Angeles writer, co-editor of Semio-texte, and novel writer as well, entitled “Critical Failure”. There are reviews of events such as Christchurch’s 4:Biennial of Public Art, which includes blogs and other approaches. Korean artists such as Choi Jeong Hwa are reviewed, one who uses detritis for his public art. A Chinese artist is also presented, as well as Performance Art at the Govett-Brewster in New Plymouth. The journal is well designed, generous in variety, well written and a mirror of what is happening in New Zealand. For subscriptions, 4 issues for $35 US to P.O. Box 6173, Wellington, New Zealand or " rel="external"> or your friendly bookshop. There weren’s many girls around, so we dated ideologies. This left us always on the brink of war. We often discussed that a likely result of battle would have been more girls to go around amongst the survivors, but we quibbled rather than acted, & slept alone in our cold beds dreaming of glory by Ami Tallman (Los Angeles, 2nd Cannons, 2007, ed. Of 500, $28.00 softbound) is a series of drawings of interiors, occasionally interrupted by men in uniform, that tells the story of a young aristocratic heir to an English country estate who abandons his manor when coerced by a fetching young member of the Red Cross into taking up trench warfare. The book follows his recollections from the field regarding his old family pile.